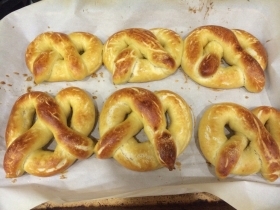 Have you made 90-Minute Soft Pretzels? 1. 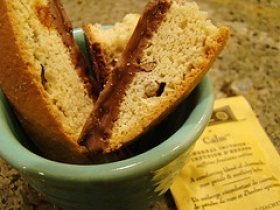 Mix 1 cup flour, sugar, salt and undissolved yeast. 2. Heat 1 cup water and margarine to 120 to 130 degrees. 3. Gradually add to dry ingredients; beat 2 minutes at medium speed of mixer. Add 1/2 cup flour. 4. Beat at high speed 2 minutes. 5. Stir in enough additional flour to make a soft dough. On floured board, knead 5 minutes. 6. 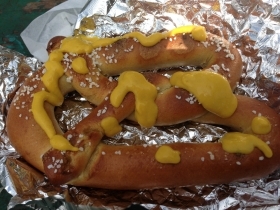 Set in greased bowl; turn to grease top. 7. Cover and let rise in warm, draft-free place 40 minutes. 8. Divide dough into 12 equal pieces. Roll each into a 20-inch rope. 9. 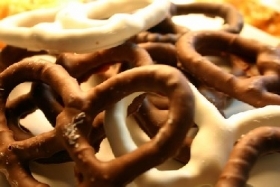 Shape into pretzels or other shapes. 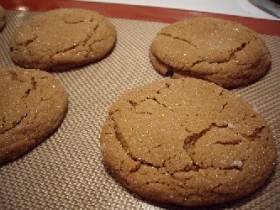 Place on greased baking sheets. 10. Cover; let rest 5 minutes. 11. 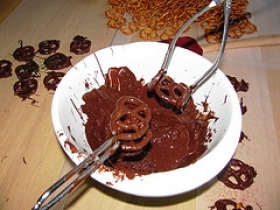 Mix egg yolk and 1 tablespoon water; brush on pretzels. Sprinkle with coarse salt. 12. Bake at 375 degrees 15 minutes or until done. Cool on racks. 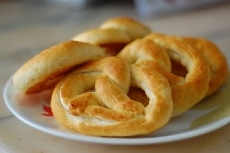 This pretzel recipe is great with mustard or melted cheese. Great afternoon snack.